In recent months, SPUR Co-Chair Jeff Couillard has been spotted making speeches and running workshops throughout Cochrane. The theme? Deep Community. We thought we would explain what we think it is, and how we might go about ensuring that our community continues to foster it. Shallow: In shallow communities, people know each other on the surface but don’t really know each other. You might run into someone over and over at the coffee shop and develop a “Hi/Bye” relationship. You might “like” things that your friends post on Facebook, but you don’t take the time to really get to know them. People in shallow communities retreat to the comfort of their computer screens or smart phones, interacting with the world through a piece of glass and an internet connection. By contrast, Deep Communities are places where people interact based on their values and their hopes. There is an absence of “they, them, the other.” Instead, people use terms like “us, ours and we.” Instead of polarizing people into opposing sides of an argument, challenges and community issues serve to unite people in collective action and a search for win-win solutions. Mutual acts of caring become the norm. In a lot of ways, Deep Community describes the kind of small town living for which Cochrane is renowned. Which brings us to ideas on how to foster this kind of community here in Cochrane, particularly during these times of tremendous growth. Here’s a quick list of our ideas. We’d love to hear your ideas! Join (or form) a community association. Plan a block party. Get to know your neighbours. Attend any number of worthwhile community events. From outhouse races to harvest dinners, parades to music festivals, there is no shortage of great ways to get together in Cochrane. Share your story, introduce yourself to someone at a coffee shop or in line for groceries. Chat with people. Put down your smartphone once in awhile. Volunteer. Nothing builds community in quite the same way as working together with like-minded people on projects that make our community better. 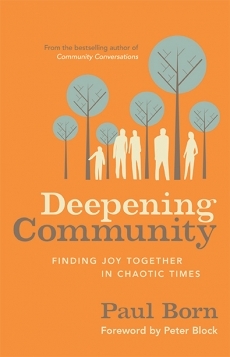 Request a “Deep Community” workshop for your organization. They’re free. And awesome.